What are the various side effects of edema? 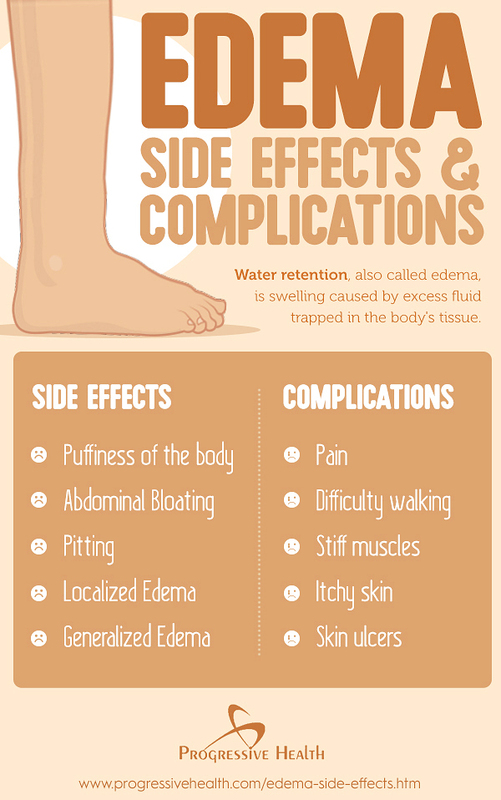 Water retention, also called edema, is swelling caused by excess fluid trapped in the body's tissue. This condition can occur in any part of the body; however, it is most commonly observed in feet, ankles, legs, hands, and arms. Edema most often occurs in the lower legs or ankles, but also may appear as generalized body puffiness or unusual weight gain. The main side effect people notice from water retention is that they are uncomfortably bloated. If you retain a large amount of fluid, you will notice swelling in your ankles, feet, and lower legs. If you apply pressure on the swollen area using your finger and it leaves an indentation that stays for some time after the release of the pressure, this type of edema is referred to as pitting edema. If the pressure applied to the skin does not result in a persistent indentation, this type of edema is known as nonpitting edema. While certain forms of edema such as cerebral and pulmonary edemas are life-threatening and immediately addressed, other forms of edema may not be urgently treated. However, edema complications can quickly develop. Some of the complications of edema include pain, difficulty walking, stiff muscles, stretched and itchy skin, tissue scarring, an opportunistic infection of the swollen areas, skin ulcers, inelasticity of blood vessels, joints and muscles as well as decreased blood circulation to the affected areas. When edema is generalized, it occurs all over the body including in multiple organs (e.g. heart and lungs) and peripherally in the limbs. However, most types of edema are specific to one organ. Some of the most common organ-specific edemas are explained below. Cerebral edema: It occurs when fluid accumulates in parts of the brain. It is a life-threatening medical condition which can be caused by disease states (e.g. lupus), abnormal metabolic conditions or oxygen deprivation at high altitudes. It causes drowsiness and loss of consciousness. Pulmonary edema: It affects the lungs but is caused by the failure of the left ventricle of the heart. When the left ventricle does not effectively return blood from the veins in the lungs back to the heart, the blood vessels of the lungs are obstructed leading to accumulation of fluids in the lungs. Fluids can also be accumulated in the pleural cavity around the lungs. It causes shortness of breath and can be due to oxygen deprivation at high altitudes or inhalation of toxic chemicals. Lymphedema: This type of edema is caused by the breakdown of the lymphatic system. Fluids are removed from the lymph to fill up other places such as the spaces between tissues and muscles. It can be caused by an underlying medical condition such as multiple sclerosis or medications such as ibuprofen. Other causes include infection of the lymphatic system, osmotic pressure from swollen lymph nodes or cancers and damage to the lymph vessels by radiation therapy. Myxedema: In this form of edema, the tissues acquire a high affinity for water. This is as a result of increased deposition of water-loving carbohydrate-like molecules such as hyaluronan in the tissue matrix. There are also other milder forms of edema such as the localized inflammation of the skin after insect bite and contact dermatitis from substances that irritate the skin. Eye puffiness is also a form of edema. It usually occurs after waking or from sleep deprivation. Diuretics are the drugs used to reduce edema. There are different types of diuretics and they are classified by their chemical structures, site of action and unique effects. The three most important classes of diuretics are discussed below. Loop Diuretics: Loop diuretics are so named because the act at the ascending limb of the loop of Henle found in the nephrons of the kidney. They are especially useful in treating edema in patients who do not respond to thiazide diuretics as well as patients who have liver cirrhosis, heart failure, and renal impairment. Loop diuretics prevent the reabsorption of sodium, chloride and potassium ions from the kidney tubules. However, they also prevent the reabsorption of calcium and magnesium ions too. By preventing the return of sodium ions, loop diuretics reduce the osmotic pressure needed to reabsorb water into the blood. Therefore, they increase urine volume while reducing blood volume. Thiazide Diuretics: Thiazide diuretics are all similar in their chemical structures. They produce their effect at the distal convoluted tubules of the kidney nephrons. While they promote sodium and potassium loss, they allow the reabsorption of calcium from the kidneys. Thiazides also decrease the osmotic pressure of water passing through the kidney to prevent its reabsorption back into the circulatory system. In this way, they reduce edema. Potassium Sparing Diuretics: Potassium-sparing diuretics are only grouped together because they do not inhibit the reabsorption of potassium in the kidneys. This advantage means that there is no need for concurrent potassium supplementation when taking these diuretics and there is also no risk of developing hyperkalemia. Potassium-sparing diuretics produce their diuretic effect by either blocking aldosterone (an important component of the renin-angiotensin system responsible for water retention) or inhibiting the sodium channels in the epithelium of the kidney. Each class of diuretics has its own set of side effects. These drugs are mostly safe but may not be well tolerated by some people. The general side effects of all diuretics include frequent urination, electrolyte imbalance, thirst, headache, muscle cramps, low blood levels of sodium, arrhythmia, nausea, and loss of appetite. There are also specific side effects. Thiazide diuretics, for example, can cause blurry vision, low levels of potassium or hypokalemia, high serum cholesterol levels, increased deposition of uric acid, impaired glucose control and symptoms of allergic reaction to thiazides. Therefore, thiazide diuretics are not recommended for edema patients who are diabetic or those who are also treating gout. Potassium supplements are recommended alongside. Loop diuretics are especially associated with very high frequency of urination. They cause dizziness, hypokalemia, low calcium and magnesium levels, increased deposition of uric acid, temporary loss of hearing, jaundice and electrolyte imbalance. Potassium-sparing diuretics can cause hyperkalemia. Symptoms of high blood levels of potassium include weakness, numbness, nervousness, irregular heartbeat, and breathing problems. Edema may be the result of a side effect of a certain medication. Because edema occurs when the tiny blood vessels in your body leak fluid, you may experience water retention when taking drugs that open blood vessels. Vasodilators, prescribed to treat high blood pressure or heart failure, dilate blood vessels to increase blood flow through your arteries. Calcium channel blockers, prescribed to treat conditions such as high blood pressure, migraines and Raynaud's disease, also relax and widen the blood vessels. Edema is also a known possible side effect of estrogens and certain diabetic medications, known as thiazolidinediones. Certain antidepressants, including MAO inhibitors (such as phenelzine and tranylcypromine) and tricyclics (such as desipramine, nortriptyline, and amitriptyline) may also cause your legs to swell. Hormones such as estrogen (in birth control pills or hormone replacement therapy) and testosterone; and some steroids may also cause edema. You may take some prescribed diuretics to treat edema. A diuretic is a water pill that encourages your body to expel water as urine. The best form of a diuretic is water. Increase your fluid intake, such as plain water, to hydrate your body and flush out all toxins. This prevents your body from retaining fluids. You must also follow a low-salt diet and avoid foods that are high in sodium. You may also consider taking a natural fluid retention remedy such as Capisette, which contains herbs like horse chestnut, gingko biloba, and buchu extracts. It replenishes the body with essential nutrients and helps in treating edema.